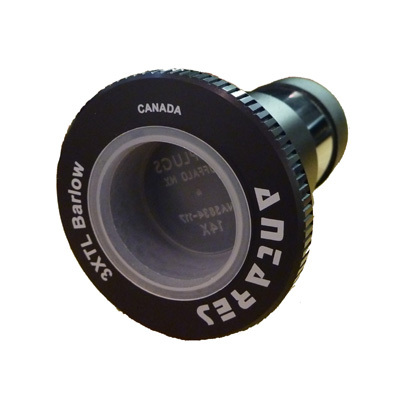 Antares x3 Twist Lock Barlow Lens 1.25"
This high-performance Antares Barlow features large 26mm-diameter optical elements (great for use with a wide range of eyepieces) and a fully multi-coated achromatic design with edge-blackened lenses for maximum contrast. The 'short' design ensures that it will work with star diagonals. 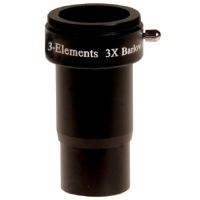 The Barlow is ideal for use with low-powered (long focal length) eyepieces to deliver higher powers, but with maximum eye-relief and viewing comfort. It is also very useful for webcam imaging and other astro-photographic applications. 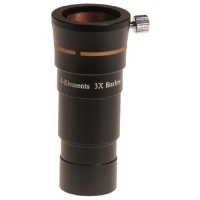 This super-quality Barlow achieves high-powered views with a high standard of colour correction – ideal for planetary and lunar observing.